Tag line: "Choose your weapon"
Sylvester Stallone. Jason Statham. Mickey Rourke. Jet Li. Steve Austin. Dolph Lundgren. Not to mention Bruce Willis and, in a brief cameo, Arnold Schwarzenegger. Did I get your attention? Well, when I first saw the trailer for The Expendables back in 2010, the fact that all these guys were going to appear together in one film sure as hell got mine! After duking it out with some Somali pirates, The Expendables, a team of mercenaries led by Barney Ross (Stallone), are approached by the mysterious Mr. Church (Willis), who wants them to remove General Garza (David Zayas), a ruthless dictator on the small island of Vilena, from power. To scope out the situation, Ross and his second-in-command, Lee Christmas (Jason Statham), fly, incognito, to Vilena, where, with the help of a local woman named Sandra (Giselle Itié), they discover Garza is merely a figurehead, and that the man actually pulling the strings is American James Munroe (Eric Roberts). Convinced Munroe is a former C.I.A. operative, Ross decides not to take the job, yet tells his team he’s going back to Vilena, alone, to save Sandra (who, it turns out, is Garza’s daughter). 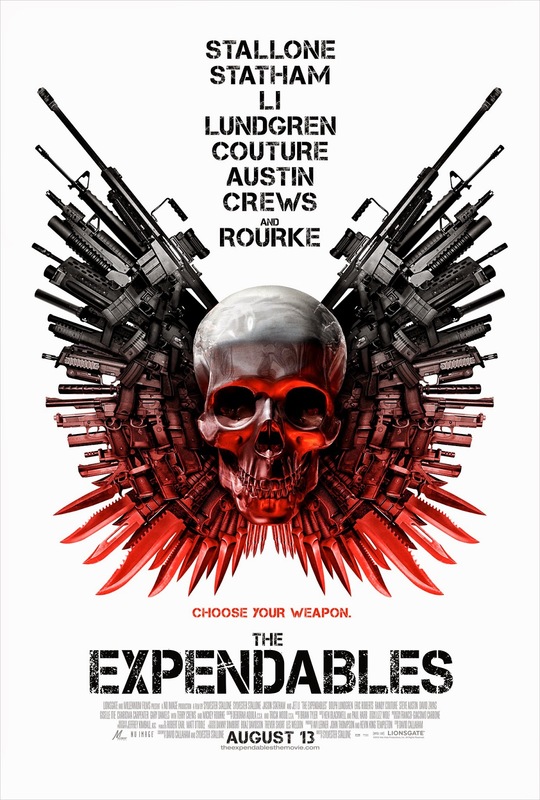 But as Ross soon learns, when one member of The Expendables puts themselves in harm’s way, the rest will be there to back him up, whether he wants them to or not. The Expendables is an incredibly entertaining throwback to the action movies of the ‘80s and ‘90s, meaning it’s short on story and long on excitement. The film is wall-to-wall thrills, starting with the opening sequence in which the group faces off against Somali pirates, a showdown that escalates when the unpredictable Gunner Jensen (Dolph Lundgren) opens fire prematurely (Barney eventually tells Gunner, who has substance abuse issues, that his services are no longer required). Also getting in on the fun are Jet Li (as martial arts master Yin Yang), Terry Crews (portraying weapons specialist Hale Caesar), and Randy Couture (as demolitions expert Toll Road), but for my money, the film’s most electrifying scene comes when Barney and Lee Christmas, who’ve just made a hasty escape from Vilena, turn their plane around and attack Gen. Garza’s troops (a battle that ends with a huge explosion). Yet as exhilarating as The Expendables can be, the movie isn’t without its quieter, dramatic moments. In one very poignant exchange, Ross’s old comrade, Tool (Rourke), tells him the story of how, when he was in Bosnia, he stood by and watched a woman commit suicide. His voice breaking, Tool says he still regrets not trying to save that woman’s life. Rourke does a phenomenal job in this scene, giving us a glimpse, however brief, into the soul of a warrior, something we seldom get in this sort of movie. Not everyone was a fan; in its review, USA Today called The Expendables “a sadistic mess”. Was it messy? Well… perhaps, but who cares? The bread and butter of a picture like this is its adrenaline-fueled action, which The Expendables has in spades. Both Expendables are favorites of mine. Sometimes you just need a good old fashion shoot'em up. Shoot em up is quite good ifiyou want to disengage your brain qnd have a good old fashioned shoot'em up.